Norfork Lake had a great spawn this year. 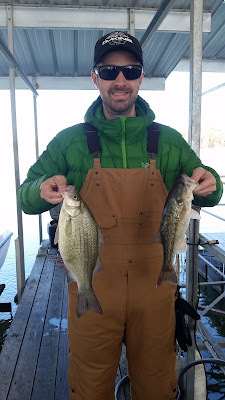 There are many white bass, largemouth, spotted and smallmouth bass in this lake. 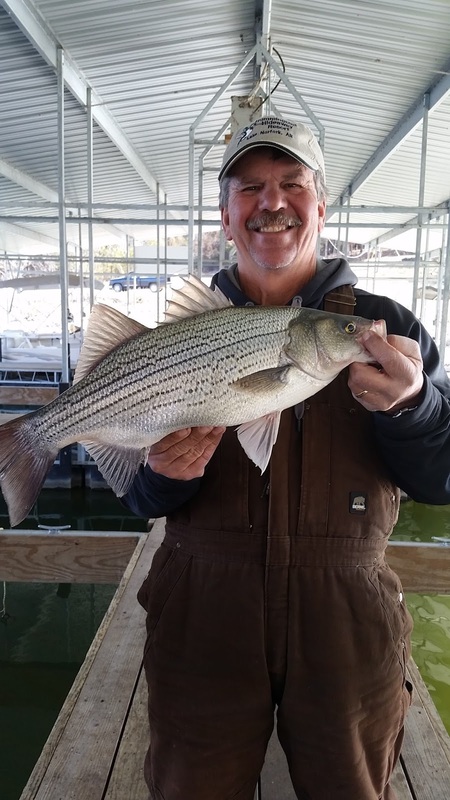 When you are fishing you will catch many smaller fish, but you will catch your fair share of the larger hybrids, stripers, crappie, white bass and large & smallmouth bass as well. 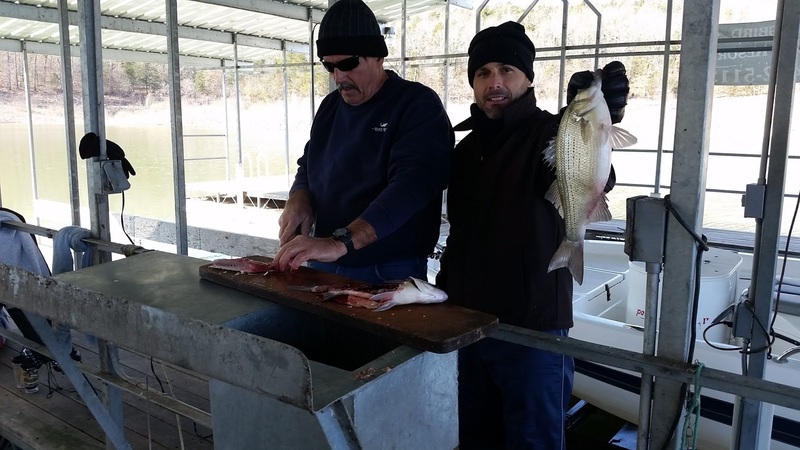 I had many of our family members with us over the holiday and we got to fish most days. 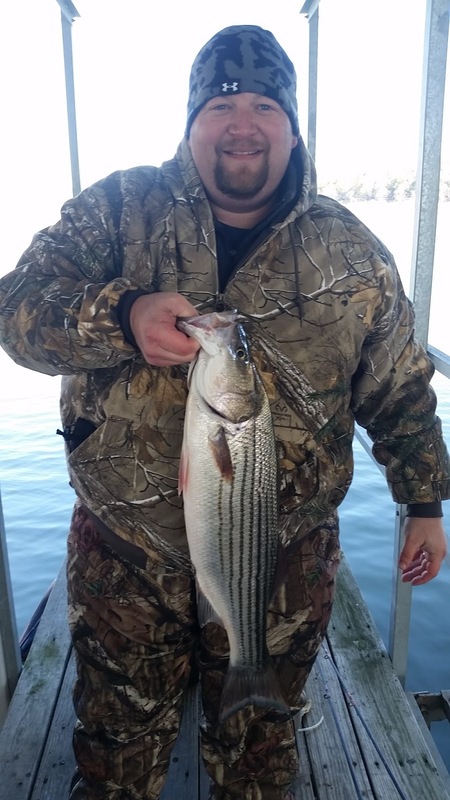 We caught many fish, not a lot of the big stripers and hybrids, but we did manage to land a few. As you would guess, as soon as all had to leave I started to find hybrids early in the morning in the same areas where we were fishing. I am still fishing the flats and have found that at day break there are big fish feeding in shallower water. I landed big 10 pound hybrids the last 2 days sitting in 17 feet of water and casting out a Kastmaster. When I retrieve my bait I let it sink about 6 to 8 seconds then I reel a little, then jerk and let it sink a little, then start it all over again until I get to the boat. The fish have typically hit the bait while it is falling. I am guessing I am 8 to 15 deep with my bait. After this early morning bite I have been vertical jigging with a spoon. I look for the bait and typically will find the fish feeding. I drop a spoon to the fish and start jigging. Most of my fish are off the bottom, but I am seeing many suspended fish which appear to be the bigger ones. 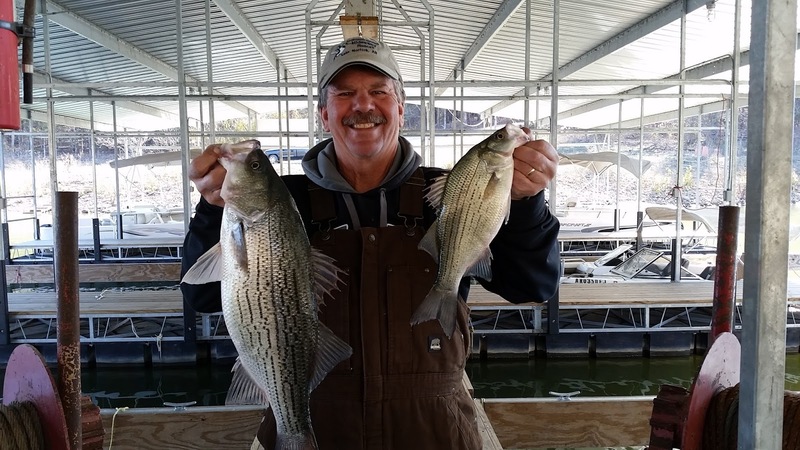 You want to reel up to the suspended fish and jig at their level. I have been fishing several flats, Big Sandy a little east of 101 boat dock, the flat in front of Fouts ramp and campground, the flat before you get to 6B which we call the cow pasture. Going west of our resort, Hummingbird Hideaway Resort, I have fished the big flat in front of Mallard Point, Cranfield Island flat and heading up river to Seward Point flat. There are whites on all these flats and you will run into schooling hybrids and stripers at any time. I have had a friend fishing Big Creek with live shiners and doing very well back by 1C and Reynolds Island for striped and hybrid bass. 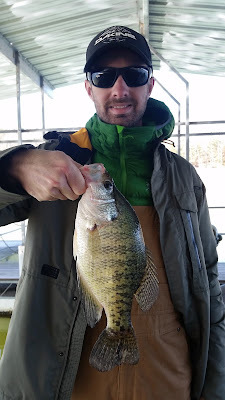 Crappie are biting fairly well. They are on brush in 20 - 35 feet of water and can be at any level depending on the time of day you are fishing. The crappie are mostly on the brush, but have been moving off the brush in towards the shoreline later in the day. 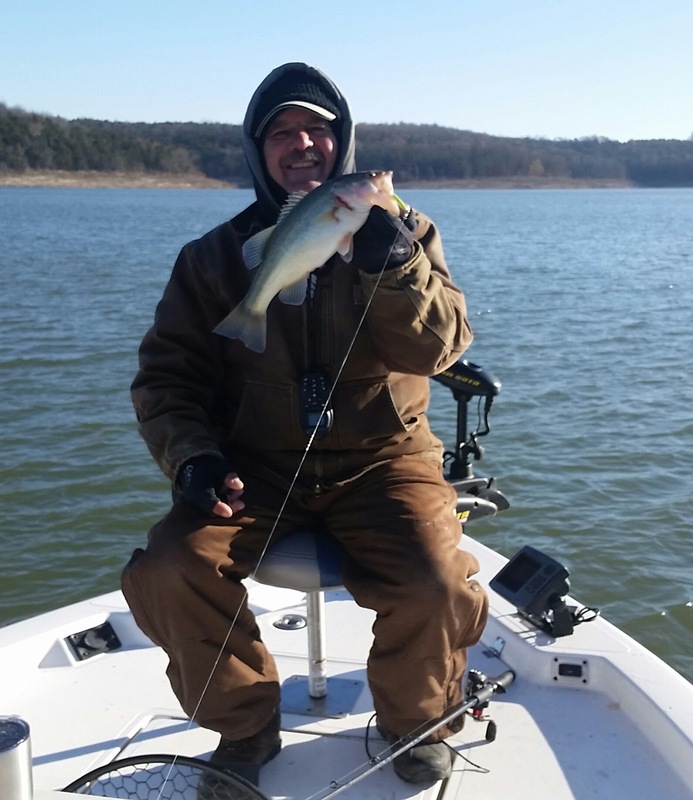 Live bait is working the best, but spoons and small jigs are still picking up some nice sized fish. Bass fishing has not really changed from my last report. 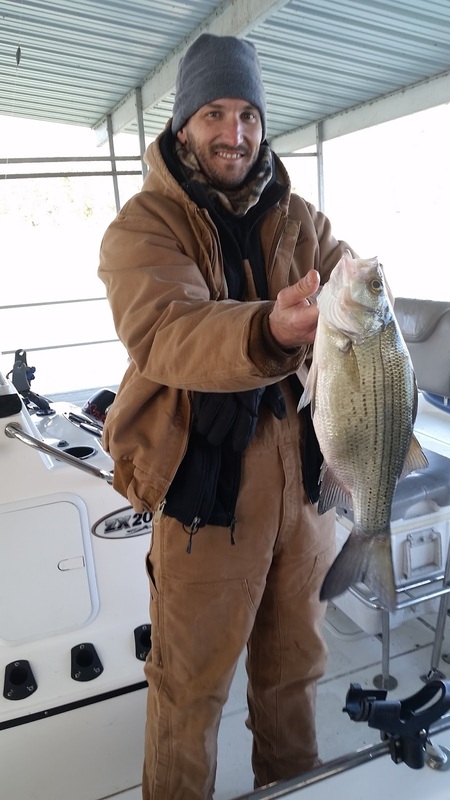 I am still finding them on the flats in 30 feet of water feeding on shad. Typically when I find them they are on the outside edge of the flat which is coming close to a deep channel or an old creek channel. 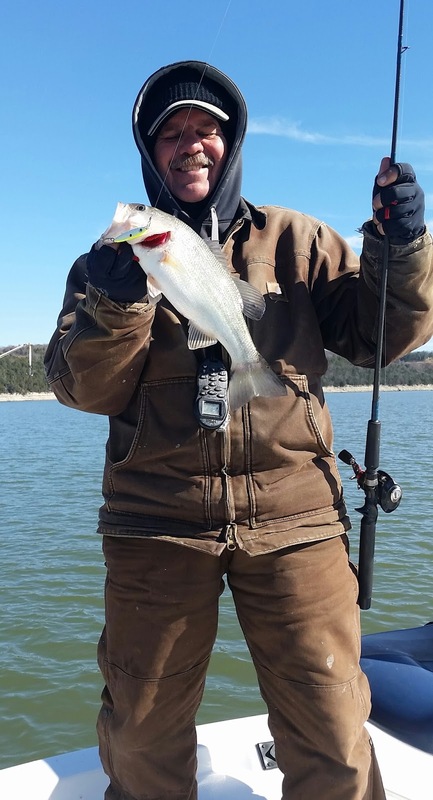 Jigging with a spoon works for me to catch these fish, but casting out a heavy jig will also pick up these fish. You could also try a finesse Ned Rig once you locate the fish. Crank baits are also picking up a lot of fish, most on the small side, but with several keepers. Look at casting on the wind blown points along the bluff lines. Jigging around brush piles is also a very good area to pick up some nice fish. Bait is typically inside of the brush so the bass will be hanging around the outside of the brush wait to ambush that stray shad. I have had guests walleye fishing and doing well right before and just after dark, casting suspending jerk baits up to the shore on the shallow banks. The moon is starting to get big so the walleye bite will even get better after dark. Norfork Lake level is falling very slowly and currently sits at 551.73. The lake surface water temperature is 58 - 60 degrees and falling very slowly. The water is still stained both on the main lake as well as in the creeks and coves. The water clarity will get clearer the closer you get to the dam.